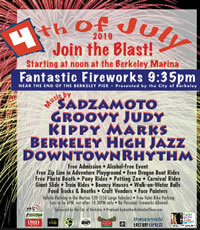 Fireworks will be shot off of a barge located just south of the Berkeley Pier, rather than off the Pier itself, at 9:35PM. Viewing is best along Seawall Drive south of the Pier or from Hs Lordships' parking lot. Presented by the City of Berkeley. WHERE IS IT AND HOW MUCH? The festival address is 201 University Ave., Berkeley, CA 94710 (map). There is no entrance fee – it is a FREE EVENT! 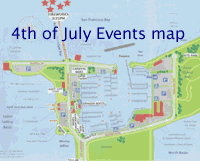 PARKING IN ALL MARINA LOTS SOUTH OF THE DOUBLETREE HOTEL IS $20 PER VEHICLE AND $50 FOR VEHICLES OVER 17'. THERE IS NO FREE PARKING IN THE SOUTHSHORE OF THE MARINA except for vehicles with a blue placard. Somewhere around 6:00PM (come in early!) the road closes to vehicles so that pedestrians & bicyclists can get in safely. After the fireworks (9:30-10:10PM) pedestrians leave first. Then the road is opened so that vehicles may leave at about 10:30PM and the exiting goes very quickly. Everyone is out by 11PM. 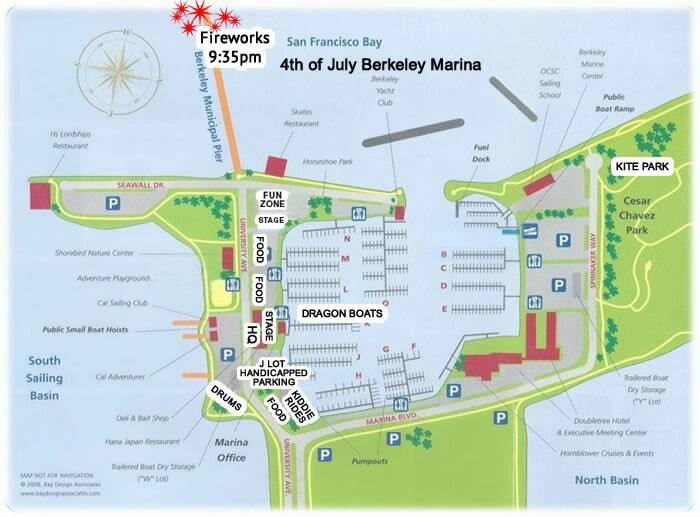 FREE ACCESSIBLE PARKING is set up for the 4th of July in J Lot that is on the south side of the marina, the second driveway on your right just before Hana Restaurant. It is monitored and tends to fill up quickly, however, and is available on a first-come, first-served basis. Decorate your bike and join the fun. Ride over the Berkeley Pedestrian Bridge and onto the newly-paved portion of the East Bay Trail that will take you right into the Festival. FREE VALET BIKE PARKING 12 Noon to 10PM near Adventure Playground at University Ave. Decorate your bike and join the fun. Take AC Transit #51B from the Ashby BART station and into the marina until 6PM. To leave on AC Transit after the fireworks, walk out over the freeway overpass to University and 5th St. Walk in anytime of day over the Berkeley Pedestrian Bridge and the East Bay Trail. When the road closes to vehicles, around 6PM, you may walk in over the University overpass. How often do you get to walk over the freeway overpass in a streaming parade of people? Bring a stroller or a wagon for your soon-to-be-tired kiddies and join the fun. Become part of the pedestrian parade! Bring a drum, come in costume, decorate your bike. The marina is extremely safe on the 4th. The City makes sure of it with over 80 of Berkeley’s finest police officers. There is adequate overhead lighting throughout the marina as it gets dark. However, please do not leave valuables in your vehicles. In over 20 years of this alcohol-free, family-friendly event, there have been no serious problems. There are many accessible restrooms at the Marina. Some are accessible fixed restrooms, and others are port-o-lets. There are changing stations in the fixed restrooms and some port-o-lets. Most areas are accessible via paved, level, smooth pathways. To request large print, Braille, or sign language interpreters call 510-548-5335 one week in advance. No BBQs, hibachi, or fires are allowed unless in one of the existing BBQ fixtures. This is an environmentally sensitive area. Plenty of BBQ for purchase at the food trucks. It is OK to bring your pets, but only on a leash and with a water dish and a doggie bag, please. If they are sensitive to crowds or loud noises, please leave them at home.